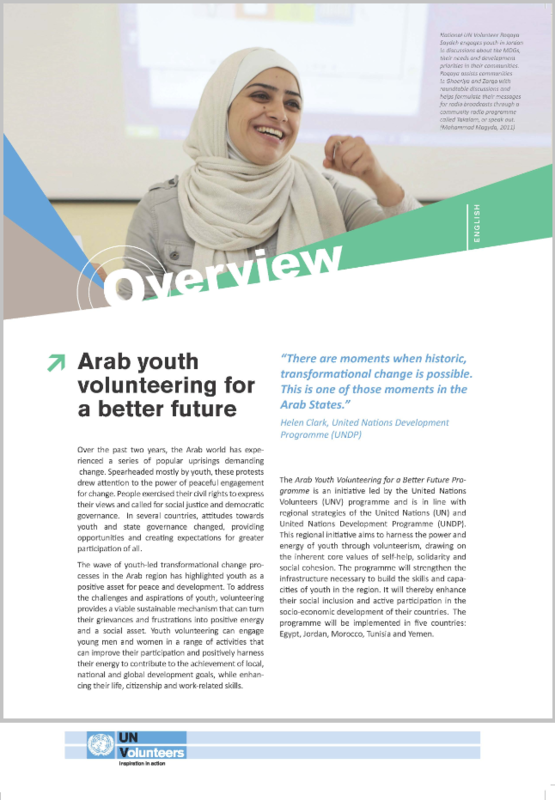 A fact sheet providing an overview of UNV's Arab Youth Volunteering for a Better Future Programme is now available in Arabic, English and French. The initiative aims to facilitate young people's participation in five Arab states through volunteerism as a positive and sustainable mechanism for effecting social change. The Arab Youth Volunteering for a Better Future Programme is an initiative led by the United Nations Volunteers (UNV) programme to facilitate young people's participation in five Arab states through volunteerism as a positive and sustainable mechanism for effecting social change. UNV and its partners recognize that youth volunteering can engage young men and women in a range of activities that can improve their participation and positively harness their energy to contribute to the achievement of local, national and global development goals. At the same time, involvement in volunteering can enhance their life, citizenship and work-related skills. In line with regional strategies of the United Nations (UN) and United Nations Development Programme (UNDP), this initiative aims to harness the power and energy of youth in Egypt, Jordan, Morocco, Tunisia and Yemen through volunteerism. It draws on inherent core values of self-help, solidarity and social cohesion. On 3 October 2012, UNV is holding a regional consultation workshop with stakeholders in Cairo, Egypt, to discuss the findings from five national consultations and agree on the strategic directions for the future of this Programme. Participants include youth, civil society organizations, government representatives, UN agencies and development partners.